Warm, moist air from the home can carry moisture rapidly from a moisture source into the building cavities where condensation can occur. Air barriers are extremely important to stopping the flow of moist air into building cavities. Sealing all penetrations in the interior membrane of the home creates an air barrier suitable for stopping moist air during the winter. Identifying and plugging air conduits like plumbing chases, chimney enclosures, and wire holes. Installing gaskets on all outlets and switches. Sealing window and door frames; patching holes and cracks in ceilings and walls. The air barrier—achieved with caulking, gaskets, and tight joints between building materials— may be separate from the vapor barrier. Many new homes employ a woven polyethylene air barrier on the outside of the exterior sheathing. 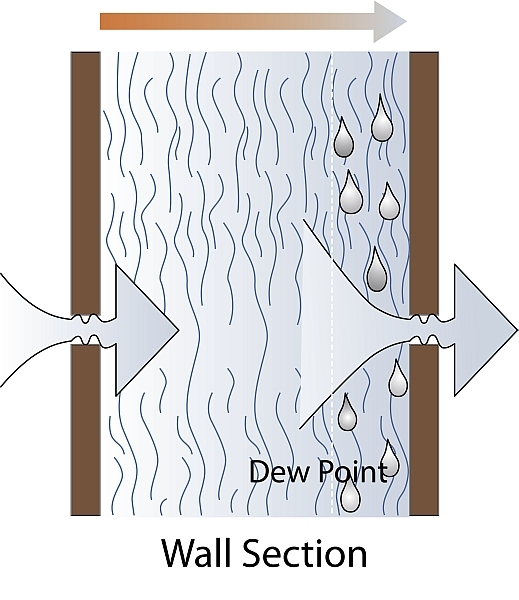 This type of air barrier is permeable to water vapor, allowing water vapor to escape. This exterior air barrier is also the capillary break that prevents wind-driven rain from penetrating the wall. Homes in hot humid climates should seal outdoor air out of exterior walls. The outdoor is the most humid air in this case, and could condense against the interior drywall while the home is being air conditioned. The exterior air barrier, like Tyvek®, is a good option for new homes or homes where siding is being replaced. For wet climates, keeping rainwater out mustn’t be neglected. Window flashing flaws have costs billions of dollars in damage to modern homes.